Dilapidated ruins, long stretch roads, museums, hillocks and more – Yadagirigutta – a town less than 100 km away from Hyderabad is a perfect weekend escape. Grab your keys and head out to this town, this weekend. Bundle up your homies and cookies (for the drive), rest your trust in Google Maps, and set off on a road trip to Yadagirigutta that’ll welcome you with boundless scenic vistas. Your first encounter is with Bhongir Fort – a 10th-century-fort that is built on an isolated monolithic rock. From a distance, the fort reminds you of an elephant, dolphin, and what not. Tell us your thoughts. After you cross the Bhongir fort, it barely takes you 30 minutes to reach Yadagirigutta. Sauntering from one hill to one another, you’ll arrive at the entrance of Lakshmi Narasimha Swamy temple of Yadagirigutta which nonchalantly stands tall amidst all the tiny souvenir shops and trees. You can either walk through the entrance or go up to the temple by car. While the parking is a little tricky because of the slope, you can request the owners of knick-knack stores to keep an eye on the car. The darshan at the temple will barely take you an hour but you might want to wander around as the view from the top is brilliant. 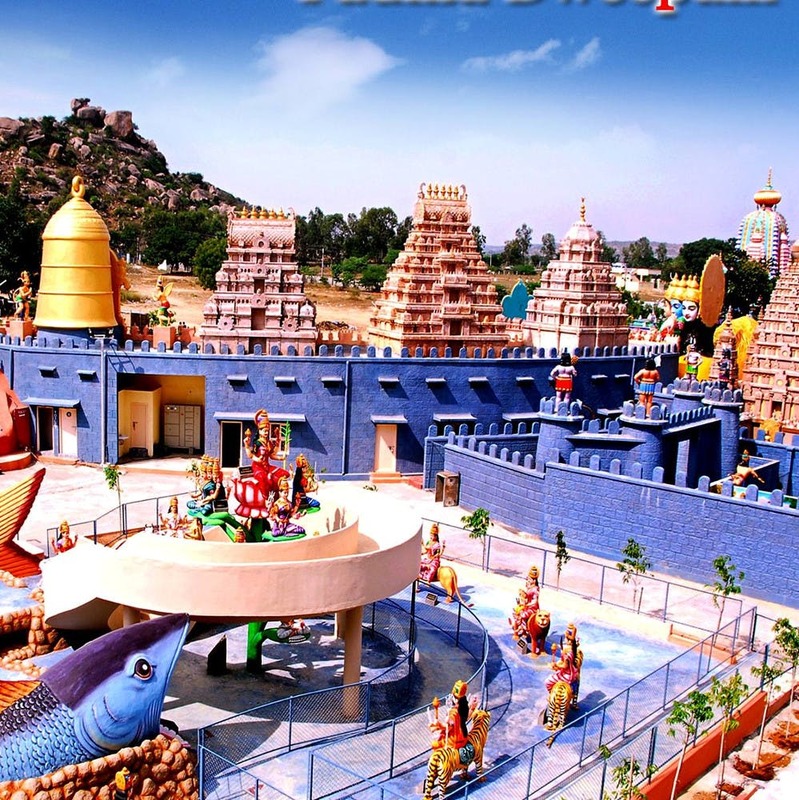 After that, you can proceed back to Hyderabad but not without checking out Surendrapuri – a mythological theme park. Here, you’ll get to witness sculptures and larger than life-size statues of deities like Hanuman, Lakshmi Devi etc. This area also has lush greenery and trees if you’re looking for a quick picnic while basking in cultural glory. We recommend you hit the highway by the sunrise hour like we did and stop for breakfast en route. If you’re looking for something authentic, you can swing by at one of the roadside hotels or dhabas for rasam idli or get to McDonald’s.